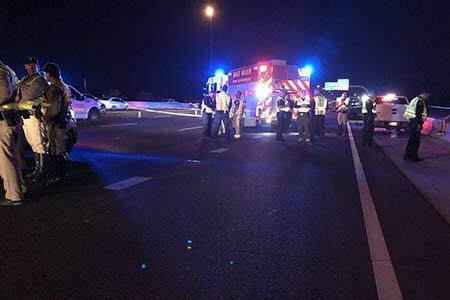 Scottsdale, Arizona—Officer Clayton Townsend, a five-year veteran of the Salt River Police Department, was struck and killed on northbound Loop 101 near Scottsdale Road at about 6:00 p.m. on Tuesday as he stood in an emergency lane next to a vehicle he had stopped. According to Arizona Department of Public Safety accident investigators, witnesses reportedly stated that Jerry Sanstead, the driver of the car that struck Mr. Townsend, appeared to be looking down, possibly at his cell phone, when he crossed two lanes of traffic before striking Mr. Townsend. Sanstead later told accident investigators that he was reading and writing text messages to his wife while driving home after work. Sanstead is jailed and charged with manslaughter, endangerment and aggravated assault with a deadly weapon. Mr. Townsend leaves behind a wife and a 10-month-old child. We extend our condolences to Officer Townsend’s family and friends over this tragic loss, which is made worse by the reckless behavior of another.